No seat cover solutions but I am sure there are options out there. I do not believe the seat covering material is actually leather (very few are) and it many senses that is a good thing for repair on the material is very easy if you know what you are doing. Auto dealers have mobile services that come right to their lots and repair tears, cracking, etc on both artificial leather and real leather. they match the color perfectly and air brush new color on to the material. I would go to a car dealer and see when such service is going to be in your area. Final product is superb. 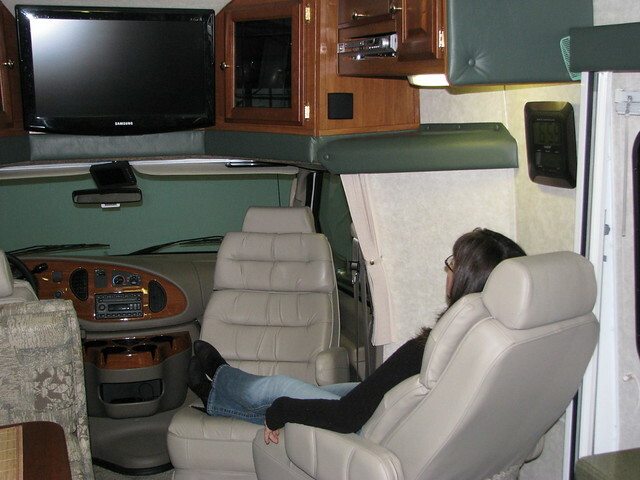 Your front seats in your 2005 were likley supplied to PC-USA by Paul's Seating. If they are like the ones in our 2007 PC-2350, they are Paul's Lexus model. I would call them and ask if they offer a solution to your problem. You might be able to purchase replacement seat base cushions, or just the cover to a seat base. Who knows, maybe they offer custom-fit covers. For kicks, ask Paul's Seating what a new seat would cost you. Back in 2010 I replaced the barrel chair with a 3rd matching captain seat. Phoenix-USA told me to work direct with Paul's Seating. The only difference is the stitching in the arm rests which you can see in this picture. The new seat also has a dial you turn manually to adjust lumbar support. I wish the original two seats up front had that feature. Paul's Seating had to make the seat special for us for they did not have one in-stock sitting on a shelf. Because of their other commitments, it took a long time to get the seat. I had to wait for their slow season in the late summer/early fall. I recall the seat with two arm rests ($10/arm rest) was $375. Shipping was an additional $100. Paul's Seating does NOT stock every color of material so don't wait for their slow season to contact them. Give them time to get the right material. The barrel chair pedestal seat tracks are spaced closer together than the front seats. A front seat will not mount directly on the barrel seat pedestal without an adapter plate. Keep this in-mind if you get the idea of moving your best front seat in back and buy two new front seats. I believe you can remove the armrest from your bad seat and mount it on the good seat to have two armrests for your 3rd seat. I think the mounting feature is behind the material in the side of the backrest. Feel through the material for something round with high areas. You cut the material and push the armrest in at a particular position, then swing it into a normal position to lock proper. Paul's Seating can give you all the details.